Easy Slots brings you Easter Island, by far one of the most entertaining slots that you’ll find at an online casino. Powered by Yggdrasil Gaming, you’ll be taken on a delightful adventure to a glorious island where two stone statues will guide you through your journey and celebrate your winning encounters. This slot has a 5-reel setup and pay-lines from anywhere between 27 and 103 depending on the re-spin element of the game. The gameplay is undoubtedly brilliant and delivers even more with three great in-game features. The Symbol Swap Re-spin, Expanding Reels and Wilds work incredibly well and give you the chance to win big. Spin and join today! 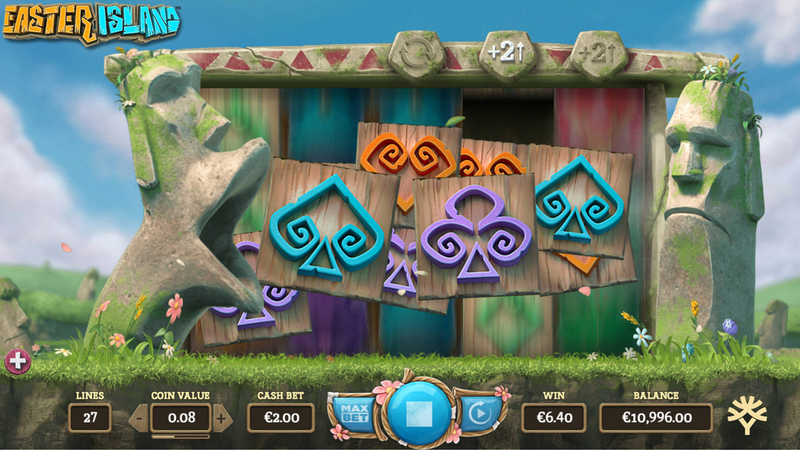 Set on a delightful island with blissful blue skies and enchanting music, Easter Island is a cheerful slot that will brighten your online gaming experience. As soon as you start playing, you’ll realise why Yggdrasil Gaming have earned so much praise in recent times. * SYMBOL SWAP RE-SPIN FEATURE – When you hit a winning spin you’ll be awarded with 1 free re-spin. Upon hitting a winning spin with low paying symbols, all other low symbols will be replaced with the winning symbols for the re-spin. Upon hitting a winning spin with high paying symbols, all other high symbols will be replaced with the winning symbols for the re-spin. * EXPANDING REELS – When you hit a 4-of-a-kind win, the reels will expand to a 5x5 setup and you’ll be awarded a free re-spin. When you hit a 5-of-a-kind win, the reels will expand to a 5x7 setup and you’ll be awarded a free re-spin. * EXPANDING WILDS – The WILDS symbols appear on reels 2 and 4. When they land on winning spins, they will stick and cover the whole reel for the free re-spin. Easter Island is one of Yggdrasil Gaming’s most unique creations. It’s unusual design and entertaining gameplay attracts a variety of different players. The low variance format allows players to have fun and constantly experience winning spins. However, the in-game bonuses can definitely create some big winning combinations. Take a trip to Easter Island today and experience the thrills for yourself. 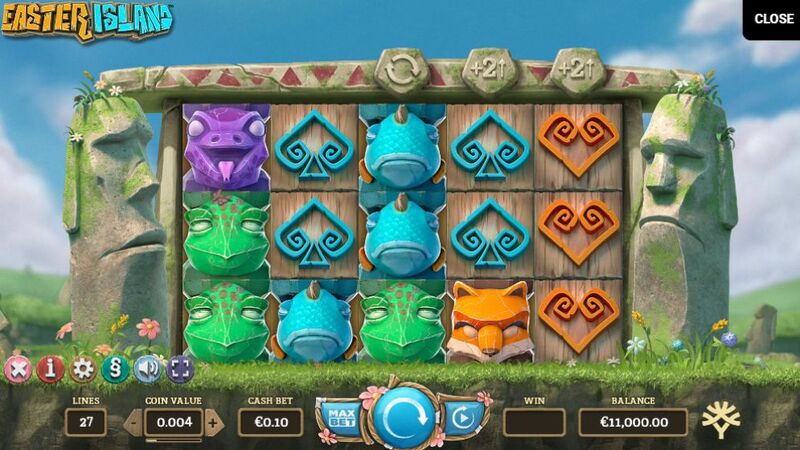 If you enjoyed Easter Island why not try Lucky Leprechaun Slots.